Mary Engelbreit presents A Night of Great Joy, a delightful picture book that celebrates the joyful season of Christmas. This book tells the story of the nativity through the performance of a children’s Christmas pageant. With adorable illustrations and simple storytelling, Engelbreit paints a wonderful picture of the night that Jesus was born. A Night of Great Joy recalls that fateful night with wonder and awe. From the arrival of Mary and Joseph in Bethlehem to the gathering of many before the baby Jesus, this holiday treasure leads children through the tale of the birth of Jesus, guiding them with the star of Bethlehem. Mary Engelbreit, New York Times bestselling illustrator of the blockbuster Christmas classic The Night Before Christmas, brings readers a new holiday picture book that’s sure to become a family favorite. Mary Engelbreit grew up studying the illustrations in the vintage storybooks of her mother’s own childhood, and she developed a unique style that harkens back to those simpler times. Mary’s distinctive images have made her a celebrity to millions, who eagerly snap up gift items, calendars, books, fabrics, and more. Mary’s dearest wish has always been to illustrate for children. Her New York Times bestselling The Night Before Christmas is already part of the holiday tradition for families across the country. A Night of Great Joy by Mary Engelbreit is a wonderful picture book that celebrates the joyful season of Christmas! My family and I love Christmas time because we love to be reminded about baby Jesus and all that God has done for us. This book is adorable because it's told through the performance of a children’s Christmas pageant. My kids love seeing the kids in the book dressed up as characters from the night that Jesus was born. 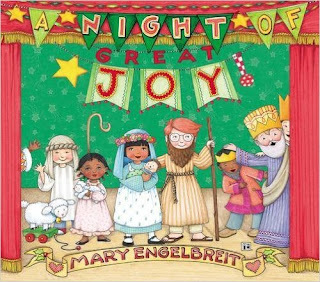 A Night of Great Joy by Mary Engelbreit is the perfect book to read to kids around Christmas to remind them why we celebrate! You can find A Night of Great Joy by Mary Engelbreit on Amazon, Barnes and Noble and other bookstores.